Here’s a quirky aspect of life in South Africa. The power goes out. Frequently. The aging electricity generation network is overburdened by demand causing planned outages to occur regularly. It's called load shedding. It's called this because the load on the plants are being lessened. While load shedding is troublesome and annoying it is better than the alternative which would be a complete collapse of the power supply nationwide for weeks, if not longer. Why is this happening? The President blames apartheid saying that the electricity was originally only meant for white neighborhoods and statistics show that twice as many households now have electricity as did in 1994 when apartheid ended. However, a lot of people aren't buying this explanation. The power plants are old, need maintenance and sometimes have to be taken offline for this purpose. New plants are under construction but delays keep occurring with new plants coming online which results in continued pressure on the current plants. There are a lot of accusations of corruption both in the government and at Eskom, the public utility company of South Africa, which cause many people to think the whole process is being severly mismanaged. In fact, the CEO at Eskom recently stepped down and is thought to have been given a "golden handshake" although the figures of what he received have not yet been published. 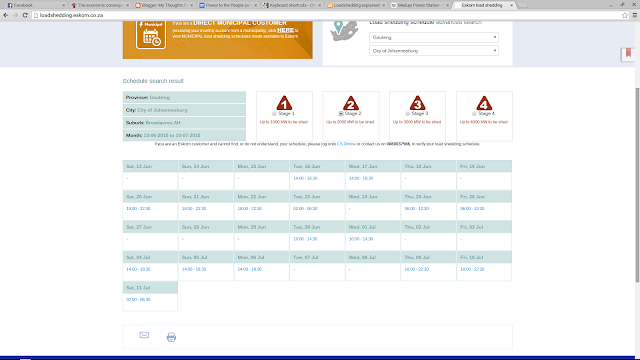 Since the outages are planned, residents can log onto Eskom's website to see if any load shedding is planned for a specific area for that day or that week. Here's part of the schedule for where we live. Just because load shedding is scheduled doesn't necessarily mean lights out. If the supply and demand are okay, the power will stay on. There are stages depending on how much power needs to be shut down. Stage 1 is up to 1000 MW (what’s an MW? Mr. Deep says its megawatt) stage 2 up to 2000 and so on all the way to stage 4. On the website schedule we can see what is listed for our neighborhood for each stage. If a neighborhood only has load shedding scheduled at stage 3 or 4 then likely the power is going to stay on because they normally don't need to cut that much. If load shedding is planned at stage 1 or 2 then it is likely the power will go out. The scheduled time for the planned outage is also listed website. Oh and let’s use military time just to make the whole thing a little more complicated and exciting. Finally just because the website says, for example, that load shedding for an area could begin at 10:00, it might not start right at 10:00 and a person might think s/he is safe until the power goes off at 10:30 or 11:00 a.m. So that's the technical side. It's almost as easy to explain as cricket. How does life work (or not work) when electricity is in short supply? I'll cover that in another post as I've got to run out now and buy some candles. The nuclear plant near Soweto was decommissioned earlier than expected for one thing. While it is true that the apartheid government neglected nonwhite areas, they did extend electricity to some of the townships but were notoriously slow about it. During the late 70's into the mid 80's the government was involved with several expensive undeclared wars with neighboring countries that when combined with financial strain resulting from the strengthening of sanctions left little money for infrastructure improvements. By the early 90's plans for electricity expansion were underway. The ANC went ahead and completed the projects that had begun but postponed the rest and spent the money on other things. By 2008 a crisis had developed and load shedding was introduced for the first time. Since then many projects have begun but are far behind schedule and are over budget. Corruption, nepotism, misappropriation of funds, bloated public payrolls, and counterproductive labor laws combine to make one whale of a mess. Add in construction workers who steal materials with abandon and a wrecked currency and the problem becomes that much worse. The people may be free from segregation and white minority rule but they have sadly traded that for a feckless public administration that they were not expecting.